The IRD model LLC-P preamp, the Purist, was introduced earlier this year to very good reviews, including the original review on TNT Audio. As a premium product at an amazingly low introductory price, the Purist was surprising in its strengths. While I noted a few minor weaknesses, in the price range of the Purist I had never heard its equal. However, despite overwhelmingly positive reviews, Curt Wishman had designed the Purist to be a truly high end product. He wasn't pleased that anyone had reported minor flaws in sound quality. Paying close attention to published reviews and comments by customers, Curt immediately went back to work. The Purist revision 1.01, which is now the standard product (the original has been superceded) is also available as an upgrade, free-of-charge, to all original Purist owners. To begin with, a few listeners with relatively high-gain audio systems found that the lowest gain setting on the original Purist (+6dB) was more than they needed - they were using less than one-half the volume control range to achieve full volume. A quick mod to a pair of resistors on the main board allowed a shift in available gain settings, reducing the lowest setting from +6dB to 0dB. This allowed the Purist to be used as a passive preamp, albeit, one with a superb volume attenuator, buffers, and proper interconnect drivers. I made this modification to the original sample during evalution. After this modification, most listeners found they preferred the sound of the Purist on the 0dB setting. The sound was reported to be smoother and allowed music to sound more natural. This, of course, comes as no surprise since the best gain for a preamp would be the lowest possible - none being preferred. 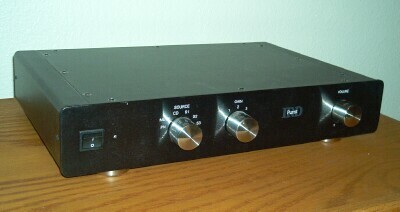 Oddly, however, some listeners heard a slight shift in sound stage when changing gain settings, a situation also noted in the original TNT review. After much effort, Curt reproduced the effect in his listening room. As he states on his website, "The difference could be heard but we could not measure any differences. Don't you just love high-end audio, you really have to learn to trust your ears." Curt reported on his website that he found a subtle interaction between the DC servo and the precision gain stage. After careful rebalancing of the DC servo setup with the new, standardized gain settings (0, +6dB, +9.5dB) and "tweaking" the loading of the precision gain stage, the Revision 1.01 was ready to go. The sample IRD Purist used in the original review was returned to the North Carolina facility for revision. Revision and shipping both ways took less than one week. On return, the Purist looked quite different - it now had the black faceplate in place of the original silver. ...And, How Does the Revised Purist Sound? First and foremost, the Purist sounds much as it did before: clean, clear, and supremely quiet. The precise musical detail and refreshing neutrality remained unchanged. In the 0dB mode, there was no apparent difference in sound - and that is a very good thing. During my initial review, using the 0dB mode revealed the purity of zero gain in this preamp. Switching to +6.5dB or +9dB changed the sound a bit in my system resulting in mids sounding a bit more forward, a slight shift in the soundstage, and some high frequency grain compared to the zero gain setting. In some equipment combinations, there is still an audible difference between zero gain and higher gain settings, though the difference is now very subtle. Using the Purist as a preamp with a Decware Zen Select SET power amp (1.8 wpc) driving a pair of DIY open baffle speakers (which used two ancient, Electro-Voice, coaxial drivers per side for 101dB efficiency, 8 ohms impedance), the higher gain settings sounded subtly veiled, as though a thin piece of acoustic speaker cloth had been placed over the speakers. In addition, there was a very slight increase in high frequency grain - very slight! As an aside, I attempted to use the MB-100 power amps with these DIY speakers, but the combination did not work well at all. It sounded brilliant and hard, harsh and sterile. Sometimes incorrect synergy results in subtle interactions that prevent optimum sound. This was not such a case as there was nothing subtle - the MB-100s and the old Electro-Voice speakers had poor synergy indeed! The audible differences between the original IRD Purist and Revision 1.01 are at first subtle. After listening for a while, it becomes obvious that the changes to the circuit allowed the higher gain settings to sound almost identical to the the zero gain setting. As a result, the revised Purist improves an already impressive product. If I had any doubt whether the IRD Purist is worth far more than the asking price, that doubt is now gone. I anxiously await the coming of the next in the LLC series of IRD preamps, the Audiophile, which combines the Purist preamp design with an active, 2-way crossover. Many thanks to Curt Wishman, president and chief audio engineer of IRD, for providing background information and the sample used in this review.